BMI Surplus, an industry leader in new and used scientific test equipment, announces the sale of a High-Performance piece of quality used test equipment, HP 8566B Spectrum Analyzer with Display – which has been tested and calibrated to NIST standards. What makes BMI Surplus stand out in their industry is their extensive inventory of used test equipment with 1000’s of various common, unique, and/or hard-to-find new and used pieces. 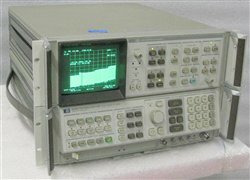 BMI Surplus’ extensive inventory of used test equipment includes manufactures such as Hewlett Packard Agilent, Tektronix, Fluke, Wavetek, Glassman, and Stanford Research. They carry everything from Amplifiers, Spectrum Analyzers, Signal Generators, Attenuators, Metering Equipment including Voltmeters, Digital Oscilloscopes, HV Power Supplies, Microwave Components, and more. While only some of their used test equipment has been tested and calibrated, as part of their service, BMI Surplus will test and/or calibrate the test equipment upon request. In addition, BMI Surplus is an industry leader in used scientific equipment with over 31,000 items that are in-stock and ready to ship. Founded by Robert Brams, BMI Surplus Inc. has been a premier seller of surplus and used scientific and test equipment for over 27 years earning its reputation in selling quality used scientific equipment, optical tables and breadboards, microscopes, microwave, computer components, optical components, and machinery. They also carry a large assortment of vacuum equipment, semi-conductor processing equipment, laboratory instrumentation, microscopes, test equipment, vehicle and avionics, process equipment, lasers and much more.